What makes a great harness? I ask myself this question with many items of gear I am lucky enough to use. If something works, why not keep using it instead of upgrading? If the new product is superior, then it makes sense to upgrade. This is the case with the new Black Diamond Chaos Harness. My criteria for a harness: Four gear loops, pre threaded waist loop (I like not having to remember to double back), light weight, packable, and comfortable. The Chaos meets all of these expectations and adds a full strength haul loop. 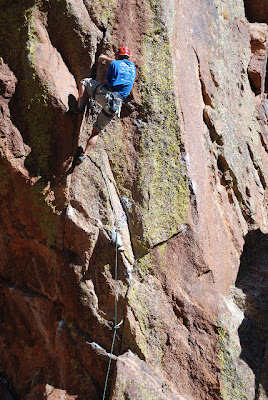 The luck was with me this fall and I was able to use the harness sport climbing in the flatirons, trad climbing in Eldorado Canyon, and climbing the classics in the Boulder Rock Club. Did I fall? You bet. Did I hang? Oh yea. Did I send? Yes. I enjoyed the harness on all excursions and forgot it was there when I was climbing. Pretty cool to not think about a harness when you are trying your very hardest. The gear loops work well, the new Kinetic Core Construction and lightweight foam is supremely comfortable, the waist is adjustable enough to go over layers or cinch down over simply a tee shirt,and the harness packs well when you are carrying a trad rack and rope in the pack. If you are looking for a new harness, or want to trade up. Try the Black Diamond Chaos harness.